Luis Marté does not have any MLB stats for the season. January 28, 2019 Atlanta Braves invited non-roster SS Luis Marte to spring training. 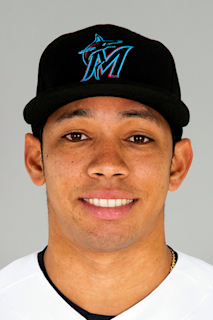 October 13, 2018 SS Luis Marte assigned to Gigantes del Cibao. July 11, 2018 SS Luis Marte assigned to Gwinnett Stripers from Mississippi Braves. May 23, 2018 Atlanta Braves signed free agent SS Luis Marte to a minor league contract. May 23, 2018 SS Luis Marte assigned to Mississippi Braves. May 18, 2018 Frisco RoughRiders released SS Luis Marte. April 20, 2018 Frisco RoughRiders activated SS Luis Marte from the temporarily inactive list. April 14, 2018 Frisco RoughRiders placed SS Luis Marte on the temporarily inactive list. March 27, 2018 SS Luis Marte assigned to Frisco RoughRiders. February 24, 2018 SS Luis Marte assigned to Texas Rangers. November 6, 2017 SS Luis Marte elected free agency. August 11, 2017 SS Luis Marte assigned to Frisco RoughRiders from Round Rock Express. August 5, 2017 Round Rock Express placed SS Luis Marte on the 7-day disabled list retroactive to August 2, 2017. July 16, 2017 SS Luis Marte assigned to Round Rock Express from Frisco RoughRiders. May 31, 2017 SS Luis Marte assigned to Frisco RoughRiders from Round Rock Express. May 6, 2017 SS Luis Marte assigned to Round Rock Express from Frisco RoughRiders. May 2, 2017 SS Luis Marte assigned to Frisco RoughRiders from Round Rock Express. April 5, 2017 SS Luis Marte assigned to Round Rock Express. February 26, 2017 SS Luis Marte assigned to Texas Rangers. October 20, 2016 SS Luis Marte assigned to Gigantes del Cibao. June 30, 2016 Frisco RoughRiders activated SS Luis Marte from the 7-day disabled list. June 23, 2016 Frisco RoughRiders sent SS Luis Marte on a rehab assignment to AZL Rangers. April 24, 2016 Frisco RoughRiders placed SS Luis Marte on the 7-day disabled list. March 29, 2016 SS Luis Marte assigned to Frisco RoughRiders from Round Rock Express. March 18, 2016 SS Luis Marte assigned to Texas Rangers. September 15, 2015 SS Luis Marte assigned to Round Rock Express from Frisco RoughRiders. June 18, 2015 SS Luis Marte assigned to Frisco RoughRiders from High Desert Mavericks. April 2, 2015 SS Luis Marte assigned to High Desert Mavericks from Hickory Crawdads. March 8, 2015 IF Luis Marte assigned to Texas Rangers. June 8, 2014 Hickory Crawdads activated SS Luis Marte from the 7-day disabled list. April 3, 2013 SS Luis Marte assigned to Hickory Crawdads from AZL Rangers. August 22, 2011 Luis Marte assigned to AZL Rangers from DSL Rangers. May 28, 2011 Luis Marte assigned to DSL Rangers from Texas Rangers. May 27, 2011 Texas Rangers signed SS Luis Marte.